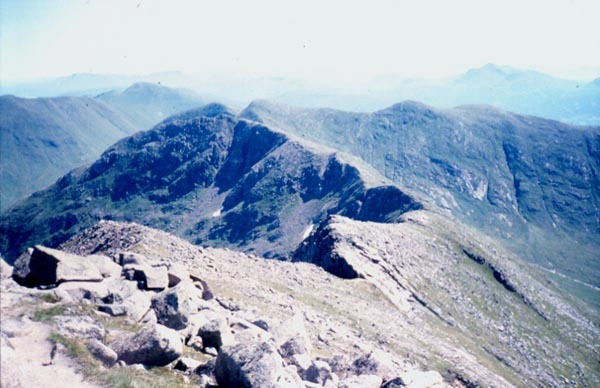 Ben Cruachan, one of the best known of the Scottish 1,000 metre (3,281 feet) mountains, has a rugged spine of several peaks running from east to west. 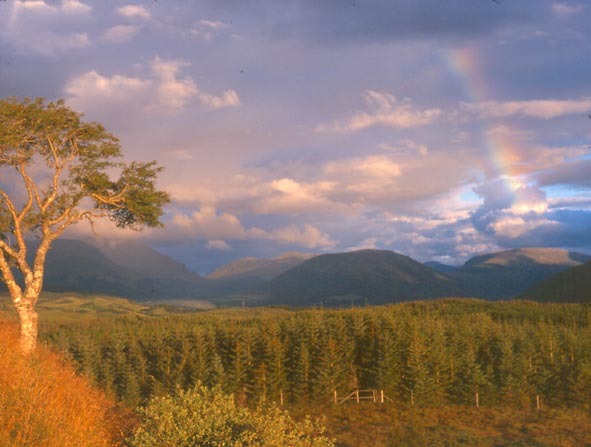 It lies to the north of the picturesque village of Lochawe which, in Victorian times, was the principal point of embarkation for visitors to the many luxurious mansions built around Loch Awe by the rich sporting gentry who spent the "season" hunting and fishing with their families and friends. The near over-bearing atmosphere engendered by the towering majesty of Ben Cruachan increases as the tapering western arm of the loch reaches the dark entrance to the grim ravine of the Pass of Brander where the precipitous granite screes must surely be witness to more unsuspected and bloody affrays than any other comparable site in the whole of the West Highlands. One kilometre deep within the hollow heart of the mountain massif is the Cruachan Hydro Electric Power Station, one of the hidden wonders of the Highlands. It opened in 1965. At its centre, inside a massive cavern high enough to house the Tower of London, enormous turbines convert the power of water into electricity, available to our homes at the flick of a switch. The route, taking in the peaks from west to east, begins from the layby on the side of the busy A85 close to the decidedly unorthodox St Conan's Kirk, fashioned from Cruachan granite which was worked, in situ, by its builders over the 49 years it took to complete. Cross the road and walk the 2.9mile/4.6km private road westwards and uphill to the dam of the Cruachan Reservoir at 1,312 feet/400m. An alternative is to start from opposite the Scottish Power Visitor Centre, a further 21/2 miles/4km further west, and follow the steep west bank of the Allt Cruachan up to the dam. Having reached the dam, continue along the rough road on the western shore for a further 1 mile/1.7km to its end. A single, rough (and sometimes very muddy) track leads off left, west-northwest, up to the Bealach Lochain below Meall Cuanail. From here it's a strenuous, but reasonably straightforward, slog northwards over the granite boulders to reach the, now sadly broken, cylindrical trig point on the main peak. The ridge path is quite distinct, if narrow and precipitous in places, and leads east-northeast over Drochaid Ghlas to the summit of Stob Diamh. If caught out by adverse weather conditions, take care not to follow the path northwards from Drochaid Ghlas as it leads to a dangerously steep descent away from the ridge. From Stob Diamh turn south to begin the descent back to the Reservoir, but bear in mind that the correct path begins just before reaching the summit cairn. Don't be tempted to head on over the top then turn south on what looks like the main path as it descends then bears away east-northeast again from the descent proper and down into Coire Creachainn. A reasonable track leads south over the 3,215 feet/980m top of Stob Garbh and down to a bealach at 2,362 feet/720m (GR: NN 096288) from where - initially indistinct at least until the convex slope decreases somewhat - it continues down and along above the eastern shore of the reservoir back to the dam and the access road back to the start. Map OS Landranger sheet 50 Glen. Start/parking Layby on the southeast side of the A85 close to St Conan's Kirk (GR: NN 114264). Grading A quite strenuous route over two Munros on varied terrain. Although some references say there is no scrambling, it is necessary, on occasion, to rely on a 'hands-on' approach to progress over some of the rocks and boulders. Ideal for fit adults and older children. Full protective weather clothing and navigational equipment must be carried. Not suitable for dogs.